Scottie called out, so you’re stuck with me. The Rondo-less Celtics played in Brooklyn against a Nets team that had won three straight going into Thursday night. I have to admit that as many other Celtics fans, I wasn’t too hopeful for a win without Rondo, who is possibly the most key piece of this offense. Just as the Celtics were starting to find some chemistry and just as Doc seemed to find a few lineups that he liked, the man who is averaging 14.6 assists per game is not available. For me, the game started out pretty hard to watch with the Nets getting several second chances on offense and it really seemed like it was going to be a rough night for the Celts. Brook Lopez and Kris Humphries seemed to have a lot of space inside to do pretty much anything they pleased as far as scoring and rebounding. When I was reminded by the announcers that Andray Blatche and Reggie Evans were the second string, I felt even worse. The first quarter ended with the Nets putting up 31 points to the Celtics 26. Things got a little bit better from here. After the Celtics settled in and started doing some basic fundamental things like boxing-out, the Celtics kept it close for the most part, hung around, and took a lead by the end of the 3rd quarter. A game that I didn’t expect to be this competitive, came down to the wire. Paul Pierce (82% FT for the year) missed two free-throws consecutively with 34 seconds remaining which would’ve cut the game to a one point deficit. He came back, after Joe Johnson hit two free throws of his own, and drained a three to bring the Celts within two (99-97). Fast forward 20 seconds to Jason Terry (86% FT for the year) missing two consecutive free throws of his own and shortly after, the game ended with a 102-97 final. If this game took place without Rondo, two weeks ago, I would predict a 15+ point victory at this point. Even as young as this season is, several players on this team have already grown mentally to the point where they are showing more confidence and starting to become as crucial to this team as they eventually will be. 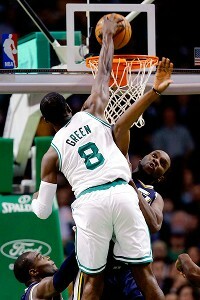 Jeff Green, while only putting five points on the scoreboard himself, showed some good work on the boards and hit a crucial three with a minute left in the game to bring the Celtics within one point. Regardless of his numbers, you can tell that he’s starting to gain confidence and believe that he can be a force for this team. Dunking on Al Jefferson’s head will do that, I suppose (See Right). Courtney Lee put up 13 points and showed some effective aggression that has been needed from him. Jason Terry contributed 10 points and looked a little bit more like Terry we expected to see from day 1. Let me just get this out there, I love Leandro Barbosa. He brings Rondo-like energy to the game and has not been apprehensive to do his thing whatsoever. He is not a great point guard and he may not always make the best decision but he is always at full throttle and wants to score the basketball. It’s unfair to be too critical of him because I don’t think he knows how to run this offense just yet, anyway. All things considered, this was not a miserable loss. This was not the same type of loss as the last 3. To be honest, I wasn’t that impressed with the Nets, but they have a bunch of talented players and they’re trying to figure out their own formula’s. They will be better the next time the Celts play them. In general, having another team with that much talent in the Atlantic doesn’t make things any easier either. The Celtics saw several players who they have been waiting to step up, start to do so. We’re starting to learn more about this team each game and there is honestly not one person on this team that I do not like seeing on the court, save Darko. I think that if the Celtics continue to show the confidence that they did in this game, they’re in great shape. I can’t wait for Avery Bradley to come back and run the floor with Rondo, Terry, Barbosa and Lee. Are the Celtics a championship contender in the current form? Absolutely not. Are they moving in the right direction while being incredibly fun to watch? I really think so. The Atlantic division’s worst, Toronto Raptors (2-6) come into Boston on Saturday November, 17th.